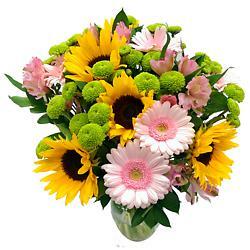 Round, sunny, broad-faced and friendly, these sunflower bouquets will bring the warmth of summer rushing in! The sunflower, also known as the helianthus, is a beacon of rustic charm, evoking thoughts of clear skies, cold lemonade, and freshly-cut hay. Nothing, but nothing, says summer like a sunflower! 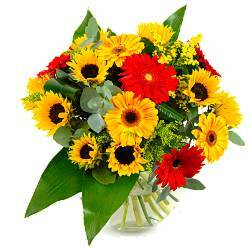 So what better way to bring the magic of summer into your home than with a fresh sunflower bouquet delivered straight to your door. So it's not surprising that so many great cultures have loved the sunflower every bit as much as we all do today. Most famously, perhaps, the helianthus was the subject of one of Vincent van Gogh's most famous paintings – simply entitled 'Sunflowers'. This amazing, cheerful flower has also been chosen by many as their symbol, from the Vegan society, to the state of Kansas, to the country of Ukraine! 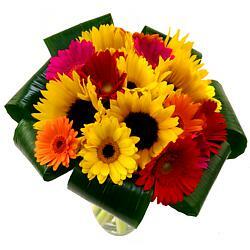 So with all of these great people rushing to be associated with the helianthus, what's stopping you getting involved? 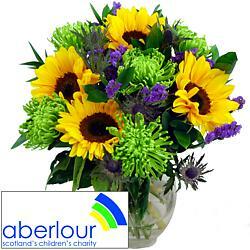 Order a big bunch of summery sunflowers from us today, and give them a great big sniff to inhale that gorgeous scent and that glorious summertime feeling. 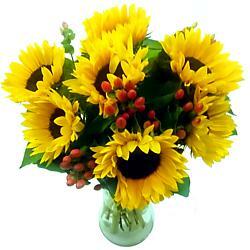 Sunflowers are said to represent feelings of adoration, faithfulness and endurance. 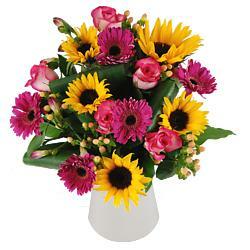 A sunflower bouquet channels the energy of the sun, evoking goodwill, positivity and energy for all those who behold it. 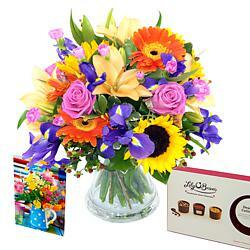 As they are considered happy flowers, sunflower bouquets are ideal as gifts to say congratulations, good luck or thank you. 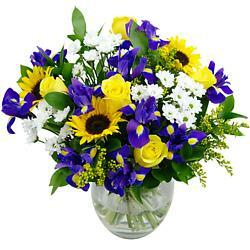 They're also lovely as birthday or anniversary gifts. 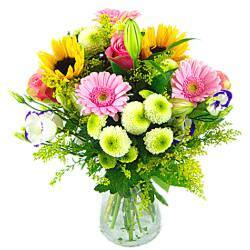 And when you order flowers online from Clare Florist, you're guaranteed great service. 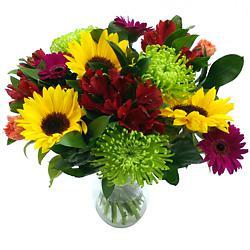 We offer FREE next-day delivery on all of our bouquets, and your sunflower bouquet will be arranged and packed by our expert team of florists, who put loving care and attention into making every last petal look wonderful.